Nightmare, or Nightmare in A Damaged Brain as it is also called is a slasher-film by Romano Scavolini, best known for its notation in the 'video nasties' list and the infamous trailer which is very misleading. Scavolini isn't mentioned in the trailer at all but the one-liner 'From the man who terrified you in Dawn of the Dead and Friday the 13th' meaning Tom Savini who refused being in the credits. 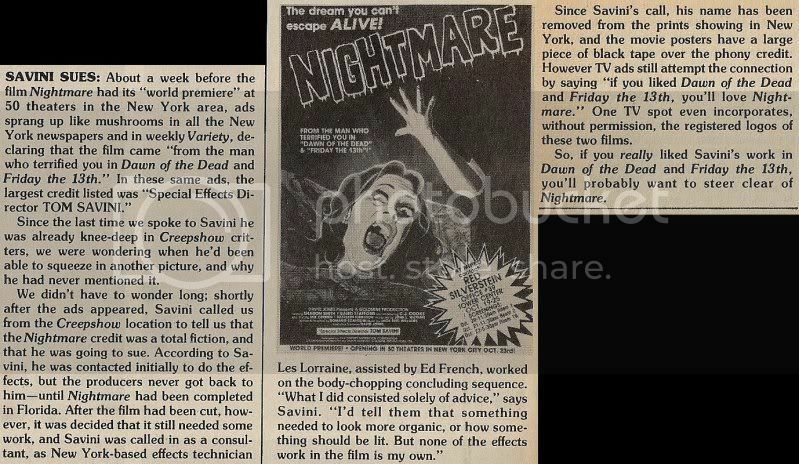 Some scans from a newspaper off the 80's put light into darkness having Savini said to give instructions but never did any of the effects by himself, the movie has some sort of Savini-feeling to it aswell. To the film itself it is a very dark and evil little slasher from the golden year of the genre, 1981. You already get a first taste of the gore it includes in the very first minutes where George Tatum, the protagonist has a vision at night showing a femaly body hacked to pieces. Then there is nothing worth mentioning for a long time, just the private life of Susan Temper, Tatum's ex-wife and her son C.J. mostly supervised by the babysitter. Honestly C.J. has to be one of the more annoying youngsters appearing in slasher films, I kinda got pissed by just seeing him doing some random stuff. The second half and especially the last minutes however is something of the best that the slasher-genre has to offer in my opinion. I also love the mask George wears during some of his killings, it's some sort of an old-man mask such as the one off Terror Train. 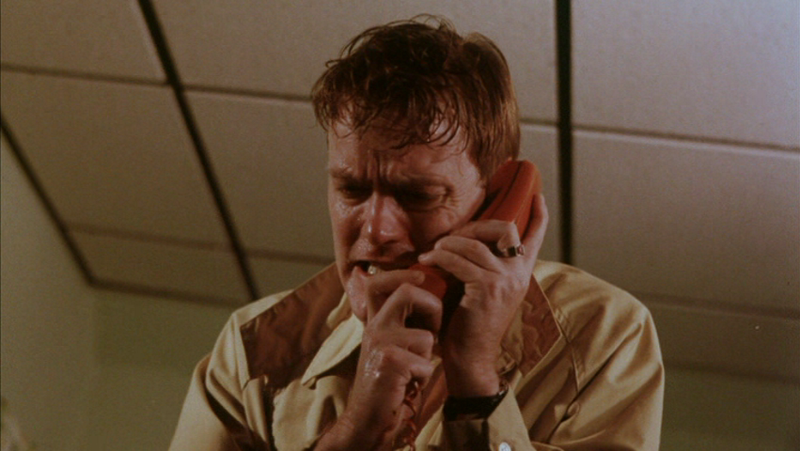 George starts calling the family and hangs up as soon as he realizes they are home which is actually very creepy and attends to the gloomy atmosphere of the whole movie. Finally George reaches the house of Susan and kills the babysitter by chopping off her hand with an ice-pick as she wants to pick up the phone and finally slitting her throat without moral or mercy. The other great scene the viewer will keep in mind is a back-flash to George's childhood where he brutally kills his father and decapitates a housemaid. I'm pretty sure Savini had his work on this scene because there are pictures of him showing young George how to hold the axe. The twist ending is then young CJ who gets in the police car for a hearing after he had killed George. He blinks to the camera with a smile before the picture fades out. I think Scavolini wanted us to think that this whole nightmare will continue in the future with CJ as he is now traumatized too, a good idea for a sequel.